When Emily Sugihara and her mom, Joan Sugihara were tired of the lack of reusable totes on the market, they launched BAGGU, producing the signature foldable nylon tote in a variety of colors. Since its inception, BAGGU has expanded, now producing bags in several fabrics and styles. Check out five of our favorite BAGGU styles, available at the Dwell Store. The original. 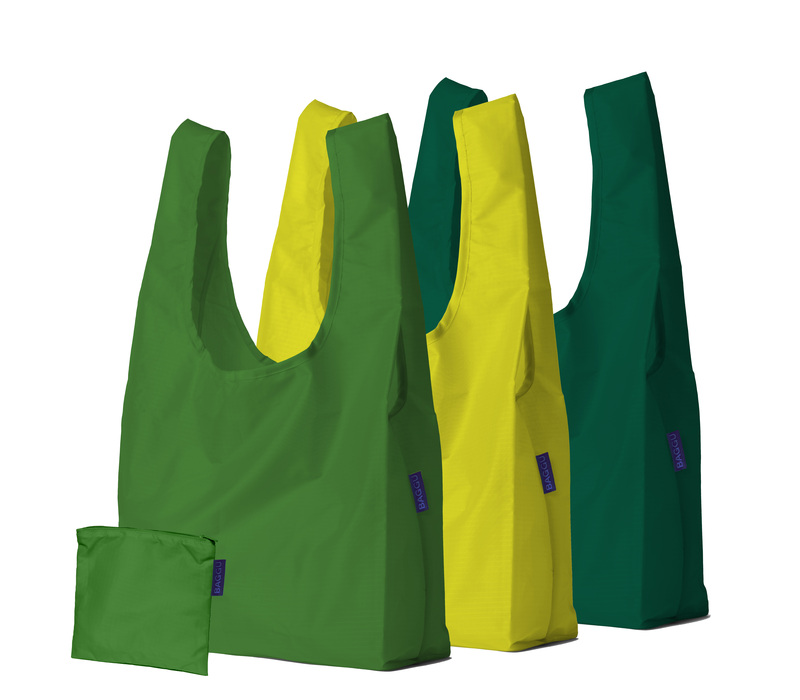 This set of three reusable totes from BAGGU is made in durable ripstop nylon, and can be used for groceries, books, beach gear, or gym clothes. Each tote conveniently folds into a pouch, making it easy to toss in a purse or backpack. The bags are also available in single versions. A luxurious upgrade to the original nylon tote, this leather bag is a roomy tote that can be used every day, but can also be dressed up for a night out. The tote has an interior pocket, ensuring that keys, phones, and other small essentials will not get lost in the shuffle. The simple, elegant bag is available in rich mahogany and brilliant navy. Designed with travel in mind, the 3D Zip Storage Bags are a colorful way to store personal items. The small size can hold jewelry and other small accessories, and the medium can fut electronic cables or small toys. The largest size is roomy enough for a pair of shoes or laundry. Ditch that old nylon duffel. This streamlined, heavy-duty canvas duffel bag is roomy, without being too bulky. It features handles and a shoulder strap, and is available in a sailor stripe pattern as well as a cool, solid black. The Duck Bag is a durable tote that is reinforced for even your heaviest items. The chestnut color makes it a unisex option that can be used for groceries, books, or laptops. The bag includes an interior snap pocket for keys, phones, and other small essentials.